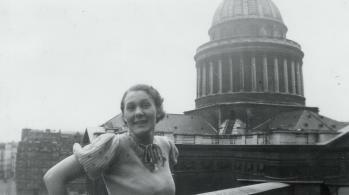 Gladys Arnold in Paris, 1938. Gladys Arnold was the sole Canadian journalist in France at the outbreak of World War II. She covered the early days of the conflict until the German occupation of Paris in June 1940. Born in Macoun on October 2, 1905, Arnold joined the Regina Leader-Post as an editorial assistant in 1930. Soon, she was writing editorials and feature articles. Seeking adventure in Europe, Arnold left her job in 1935 and traveled to England aboard a grain cargo ship. She found herself in Paris, where she intended to study the modern age philosophies of socialism, communism, and fascism. Arnold began submitting freelance pieces to the Canadian Press and was soon hired as their Paris correspondent. In the next four years she reported from France and Germany on the Spanish civil war, the Austrian Anschluss with Germany, and the Munich agreement regarding Czechoslovakia. After the fall of Paris, Arnold returned to Canada and worked tirelessly for the Free French. From the end of the war until her retirement in 1971, Arnold headed the information service of the French embassy in Ottawa. Gladys Arnold died in Regina on September 29, 2002. Arnold, Gladys. 1987. One Woman's War: A Canadian Reporter with the Free French. Toronto: Lorimer.